Because taste, particular needs and more importantly budgets matter you need variety. When it comes to holiday accommodation we demand prices seeing our money go further while comfort and good location is guaranteed. 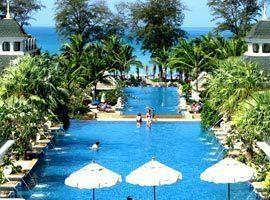 Fortunately this world renowned leisure destination in Thailand has a plethora places to stay and at each of them we guarantee the best Phuket hotel deals. With years of experience in the business of satisfying guest demand in Thailand, we know that opinions of the best hotels differ from one person to the next and depend on many preference factors. Instead of therefore giving you a short list of what we believe to be the 10 best resorts we have researched and grouped together our 6 front runners in each accommodation category. Below we list resort deals which are ideal for families, the most romantic honeymoon places to stay which include villas with private pools as well as 6 great budget stays. 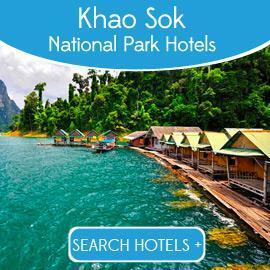 But don't stop here, check out our extensive range of Phuket accommodation in each of the popular beaches such as Karon, Patong and Kata which you will find under Featured Places to your left or use our yellow search box and browse at your leisure. You will notice all hotels with special offers are clearly marked. Located in Karon this beachfront resort is ideal for couples and families featuring romantic villas with private pools, 2 bedroom accommodation and facilities like a water park, kids club and spa. 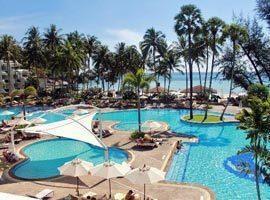 La Flora has an unbeatable location directly on the beach in Patong. It offers luxury sea view rooms, rooms with direct pool access and private beachfront pool villas and is close to entertainment and nightlife. Located on a private beach in Relax Bay it is moments from either Karon and Patong Beach and offers luxury ocean view rooms featuring private balconies. Facilities include a kids club and cooking classes. Featuring luxury 2 bedroom suites with private plunge pools and 2 bedroom deluxe apartments with direct pool access The Chava Resort offers the ultimate family friendly accommodation in Surin Beach. 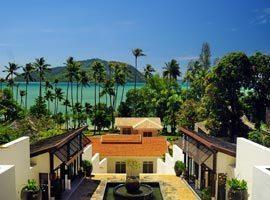 Located on a sloping hill this luxury resort boasts a privileged and exclusive waterfront setting 15 minutes from Patong. 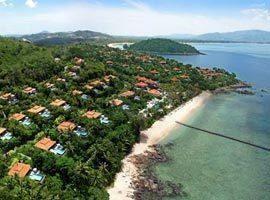 It offers charming 1 and 2 bedroom cottages and romantic beachfront studios. Set against a cliff face in a private bay directly above the beach featuring lavish honeymoon accommodation in luxurious pool villas and 2 and 3 bedroom family residences with equipped kitchens. Directly on the beach in Bangtao Bay Angsana Laguna is 20 minutes from Patong and feature the ultimate facilities for families including a kids club, 323 meter pool, 18 hole golf course and beach club. In this case you really do need to book early to avoid disappointment. Located near entertainment it offers family accommodation deals in a Kids Suite and Family Suite featuring separate areas for children. 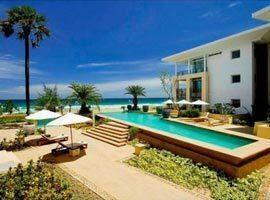 Malisa Villa Suites is located in Kata Beach and features a 2 bedroom family suite which is ideal for up to 4 guests. The villa features extra conveniences like an open-air kitchen, dining room and living area. 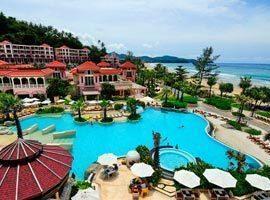 Movenpick Resort and Spa is located on Karon Beach. 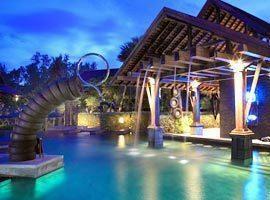 It features one of the biggest kids clubs in Phuket and a pool with water slide. 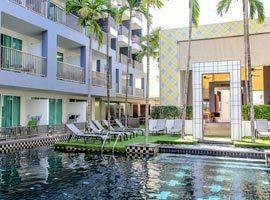 It offers 2 bedroom accommodation in a suite or residence with a kitchenette. Located in Cherng Talay amid placid lakes Outrigger Laguna offers a kids club, one bedroom suites and 2 bedroom villas with separate living areas and large balconies with either lagoon or ocean views. Walking distance from entertainment Graceland offers large family friendly accommodation with 2 bedrooms as well as a family pool access room, a kids club and fountain pools. 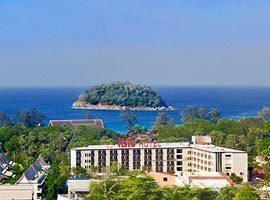 Located in an intimate cove 30 minutes from Patong and surrounded by the natural beauty of a protected forest park. 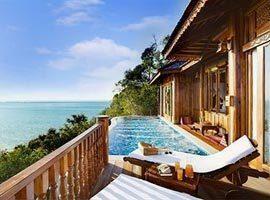 It offers beachfront pool villas, sea view rooms and award winning spa. Indigo Pearl is located in tranquil Nai Yang exuding raw sensuality and industrial chic. Here you can soak in blissful seclusion in your villa's private pool and benefit from spa treatments in a rain forest setting. The best place for honeymoon couples to enjoy an authentic lifestyle experience in private pool villas set on an island retaining its original charms. 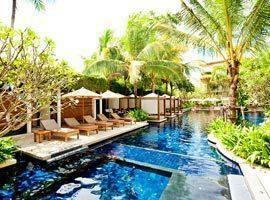 Santhiya is located on Yao Yai 30 minutes from Phuket. Located on nearby Yao Noi Island Six Senses is a luxury haven of tranquility nestling amid lush rain forest on a pristine island with views of mystical Phang Nga Bay. 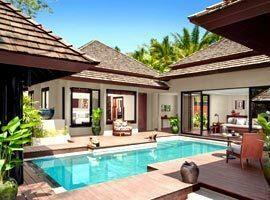 Island style villas feature private pools. 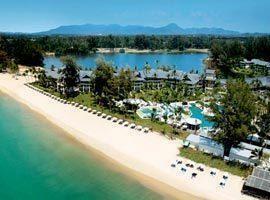 The Shore at Katathani is the ultimate honeymoon hotel in Kata Beach. It is located on Kata Noi, a romantic cove offering more privacy than elsewhere, yet still allow easy access to entertainment. 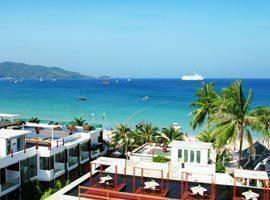 The Vijitt is located 30 minutes from Patong in Rawai on the spectacular Panwa Peninsula away from large tourist crowds. 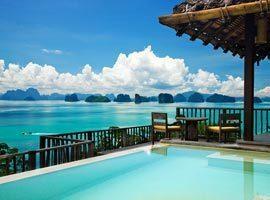 It allows views of captivating Phan Nga Bay from luxury beachfront pool villas. 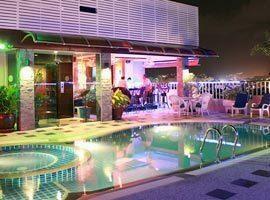 Budget accommodation with faultless guest reviews located near Banzaan market and nightlife. Yet you will sleep without hearing a peep. Features a rooftop pool with swim-up bar. 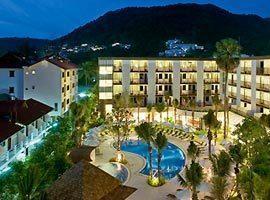 Budget deal at charming value for money Patong hotel near entertainment and the beach with good guest reviews. The modern rooms offer Wi-Fi internet, safety deposit box and satellite TV. 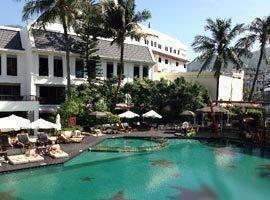 Managed by Accor you can expect the highest standard facilities a moment's walk from beautiful Kata Beach. 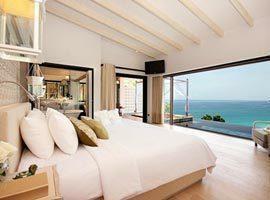 Rooms feature facilities such as wi-fi internet, a fridge, satellite TV and balconies with pool views. Captures the island's rich history with an authentic design showcasing its European colonial influence. Rooms are tastefully decorated with the right touch of elegant sophistication. 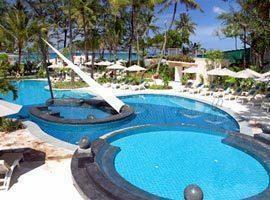 Artful creativity with themed rooms in Karon Beach the resort is one of a kind. It features deluxe pool view rooms with private balconies as well as deluxe rooms with pool access straight from your balcony. 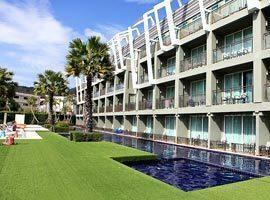 Modern, fashionably stylish and trendy Sugar Marina is located in Kata Beach. 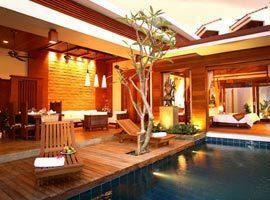 It features a designer swimming pool and offers deluxe rooms with private balconies as well as deluxe pool access rooms.